[Miscellaneous] Blog Olympics 2015 – Introductions | thoughts and afterthoughts. 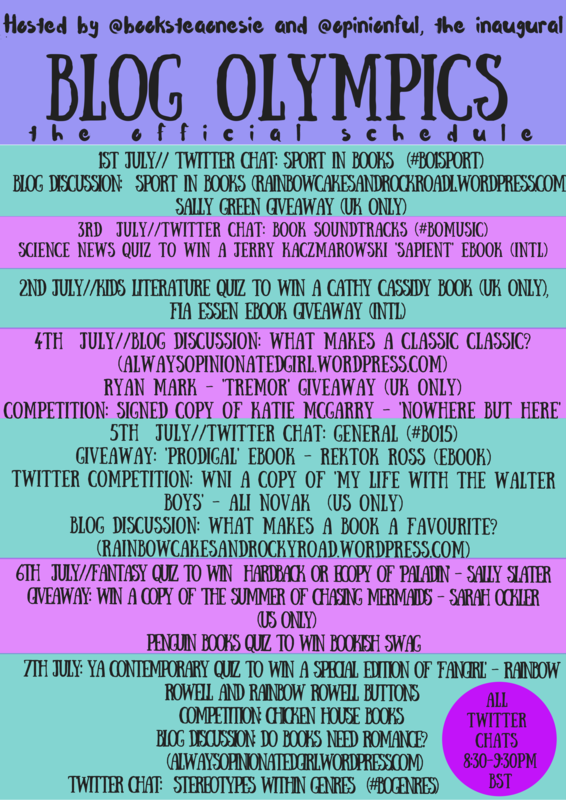 The Blog Olympics was created by fellow book bloggers, Books, Tea and a Onesie and Always Opinionated Girl, and takes place from July 1st-7th, 2015. This blogging event features things like blog discussions, twitter chats, giveaways, and competitions. See below for scheduling details. While I’m not directly affiliated with the Blog Olympics, I figured it’d be awesome to give this week-long blog event a shout-out as I can only empathize with all of the work it took behind the scenes to get everything up and running. All associated links refer back to their respective Goodreads or blogs. *Note: the timing of twitter chats of 8:30-9:30PM BST (3:30pm EST/12:30pm PST) isn’t ideal for some regions (being 5am-ish in Australia or 3:30am in Philippines) but that doesn’t mean you can’t still get involved in the blog discussions etc. Now that you’ve read what there is to offer, are you going to participate? For me, this blogging event is an excellent platform to encourage the development of some Think Aloud writing pieces. I realize that this goes against the grain of the hosted discussions on their blogs but I’ll try to be doing both. It’s just that, if you know me, the crassness and (hopefully) witty nature of these upcoming rants need its own outlet of exploration. I encourage you to blog however you want as long as you’re involved in the festivities. So, yeah, be sure to check back here as I have some ridiculous rants that i hope you’ll find amusement and joy in! I’m looking forward to these rants! Laughter will ensue in T-Minus 26 Hours! Yay! First topic’s sports! Can’t wait to see what you’ve put together for that, Joey! Haha. PREPARE YOURSELF FOR RIDICULOUSNESS. No, really, it’s such a pointless thing I ranted about–BUT ALSO EXTREMELY RELEVANT. Pingback: [Think Aloud] – #18 – “Wednesday’s Are Leg Days” Said No One Ever in Fiction | thoughts and afterthoughts. Pingback: [Retrospective] – A Rewind Of: June 2015 | thoughts and afterthoughts. Pingback: [Think Aloud] – #19 – “Dear Year 3000” | thoughts and afterthoughts.